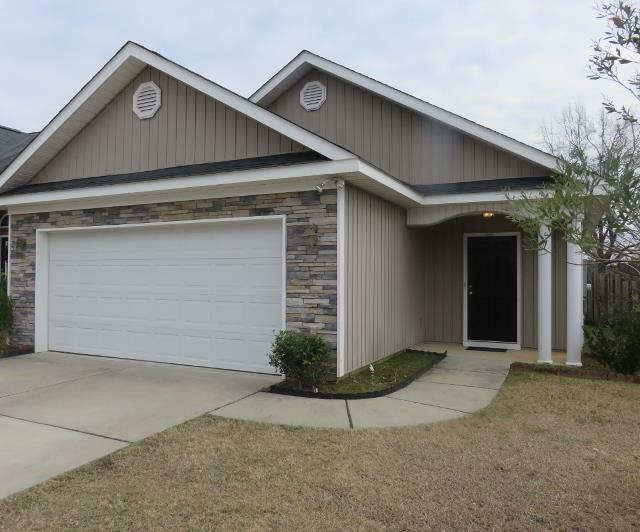 Beautiful single story single family home in the High Meadows neighborhood on Dunrobin Lane. The front door of the 3 bed 2 bath charmer opens onto a spacious greatroom with high ceilings and wood flooring. Just off of the greatroom are 2 good sized bedrooms, perfect for guests or children, and a full guest bathroom with tub/shower combo and ceramic tile floors. Pass through the greatroom and find yourself in the open kitchen/dining room complete with ceramic tile flooring, all electric appliances including a refrigerator, and large back windows and door inviting you to the spacious backyard. At the back of the house you will also find the oversized owners bedroom with its spacious walk in closet and en suite. The en suite features a dual vanity, garden tub, stand up shower, and continues the trend of ceramic flooring. Outside you will discover a fully fenced backyard complete with an in-ground sprinkler system that provides additional privacy by backing up to a greenspace.